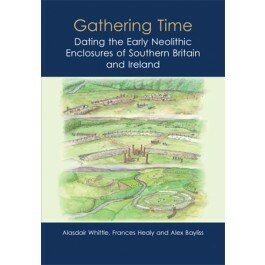 Gathering Time presents the results of a major dating programme that re-writes the early Neolithic of Britain by more accurately dating enclosures, a phenomenon that first appeared in the early Neolithic: places of construction, labour, assembly, ritual and deposition. The project has combined hundreds of new radiocarbon dates with hundreds of existing dates, using a Bayesian statistical framework. Such formal chronological modelling is essential if significantly more precise and robust date estimates are to be achieved than those currently available from informal inspection of calibrated radiocarbon dates. The resulting dating project included over 35 enclosures - the largest study so far attempted in a Bayesian framework. This establishes a new chronology for causewayed and related enclosures in southern Britain, which appeared in the final decades of the 38th century cal BC, increased in number dramatically in the 37th century cal BC, and began no longer to be built by the end of the 36th century cal BC. Several enclosures were of short duration - in some cases probably in use for less than a generation - though some examples do conform to the conventional assumption of a long primary use-life. In Ireland, enclosures of this kind are much scarcer. The project helped to date two of these: Donegore, Co. Antrim and Magheraboy, Co. Sligo. As well as establishing a new chronology for enclosures, Gathering Time also places these results into their wider context, by considering the chronology of the early Neolithic as a whole. Well over a thousand other radiocarbon dates have been critically assessed and modelled in a Bayesian framework - for settlement, monument building and other activity, region by region across southern Britain and across Ireland as a whole (a brief comparative study of Scotland as far north as the Great Glen is also included). Generally in southern Britain other Neolithic activity can be dated before the beginnings of monument building and, among the monuments, long barrows, long cairns, and related forms clearly preceded the earliest causewayed enclosures. The first Neolithic things and practices probably appeared in south-east England in the 41st century cal BC, arguably by some kind of small-scale colonisation from the adjacent continent, and spread at a variable pace across the rest of Britain and Ireland over the next two and a half centuries or more, a process involving acculturation of local people as well as immigrants. Enclosures may have been adapted as a social strategy of harnessing the power of the distant and the exotic, and perhaps old ancestral ties to the European continent, in a dynamic and rapidly changing social milieu. Close attention is given to themes of deposition, material culture and different kinds of social interaction, from networks of exchange to episodes of violence. A high tempo of change continued, as very different constructions came to be built from the 36th century cal BC onwards: the linear and more arcane cursus monuments. The study of Irish Neolithic chronology reveals significant patterning, including a short currency for rectangular timber houses in the 37th century cal BC, but also highlights the challenge of establishing more reliable chronologies, for monuments in particular. Alternative scenarios for the date and nature of the beginning of the Neolithic in Ireland are modelled. Gathering Time ends with reflections on the nature and pace of change in prehistory. If generational timescales are now within our grasp routinely, more subtle and individualised kinds of (pre)history can and must be written, and the conventional frame of the long-term must shift from being familiar and comfortable to problematic.